Okay, here we have it, the no nonsense "Mopar For Mopars" solutions blog. This is a blog where any or all Mopar solutions can be entered, added, discussed and debated. I am not limiting this to the Chrysler flathead 6 engine, so other Mopar Engines, Drive lines, Transmissions, Ignitiion, Electrical and Suspension, Steering and Brakes. So please share what and how you have done something, utilizing Ma Mopar components and Parts. If you are contemplating some modification however radical post your progress and results. Off topic brands and posts will be deleted, so keep this Mopar as the title suggests. There has been a lot of discussion, Thread Themes, and Ideas that are not Mopar based, so here we have the Topic that focuses on a Chryco answer for our needs. 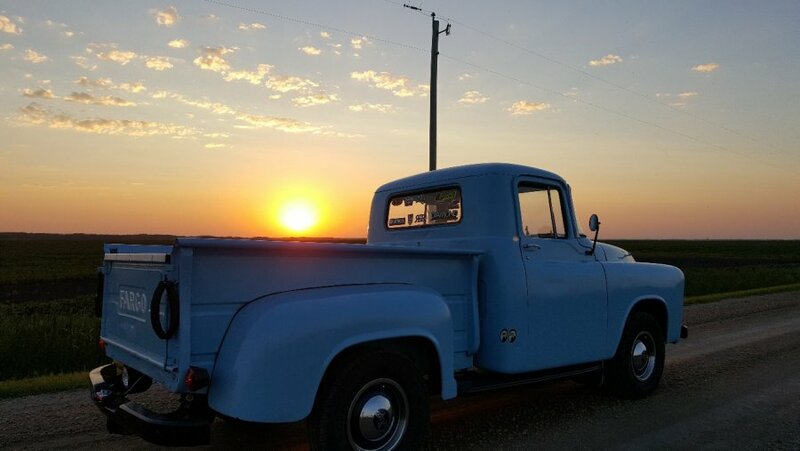 Okay, so the current engine in my 55 Fargo is a correct numbers 1954-56 Canadian Dodge or Fargo engine, and could very well be a 54 or eraly 55 as it is a 228. I do not have a spec for HP, Torque or Compression Ratio. My little engine has always ran good, burns no oil, and never smokes, and has very little blowby. She starts well, has the usual small amounts of oil leaking etc. 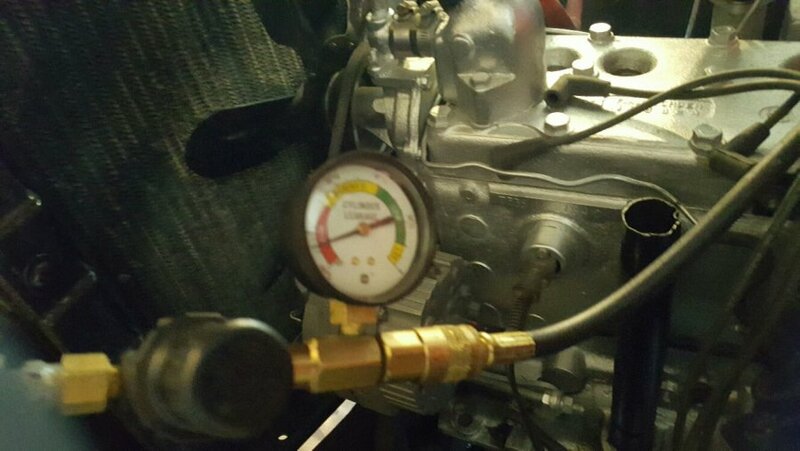 I have done a compression test, both dry and wt, with a good and warm engine. 90-95 in 5 cyls, cyl #4 is 85, adding oil did not change the results to any degree. 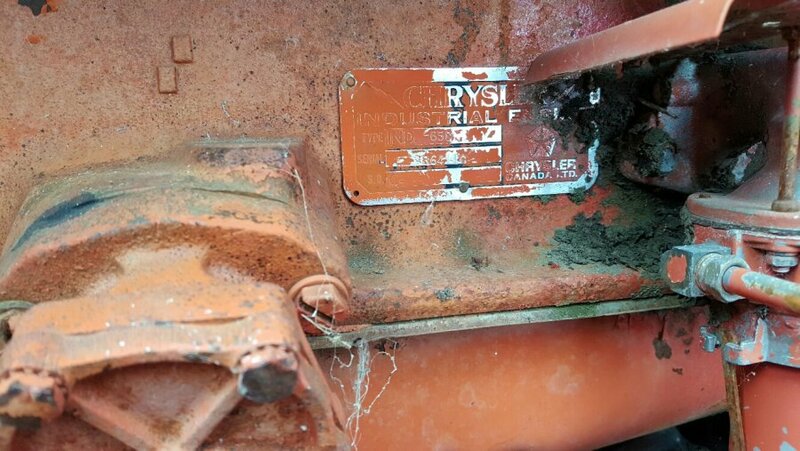 So next was time for a "Leak Down Test", on a warmed up engine, this engine has 40% leakage with cyl #4 in the 80 % range. There is no air loss via the intake or exhaust, all out the crankcase, so no doubt cylinder and ring wear, or possibly broken rings. I did the test 3 times, to make very sure. 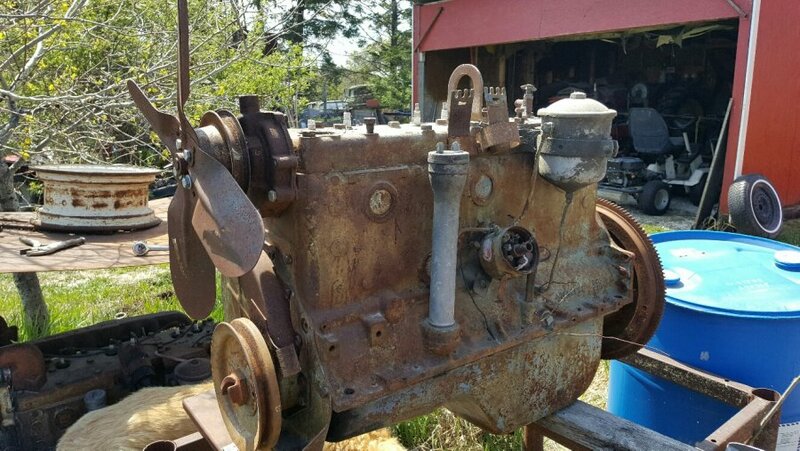 I will run my little engine for the summer, and most likely install a 265 this fall or winter, do not think I will be rebuilding this engine. If I did rebuild it, most likely would go over bore to 3 7/16 pistons, a nd a hotter cam with a milled head for added compression. 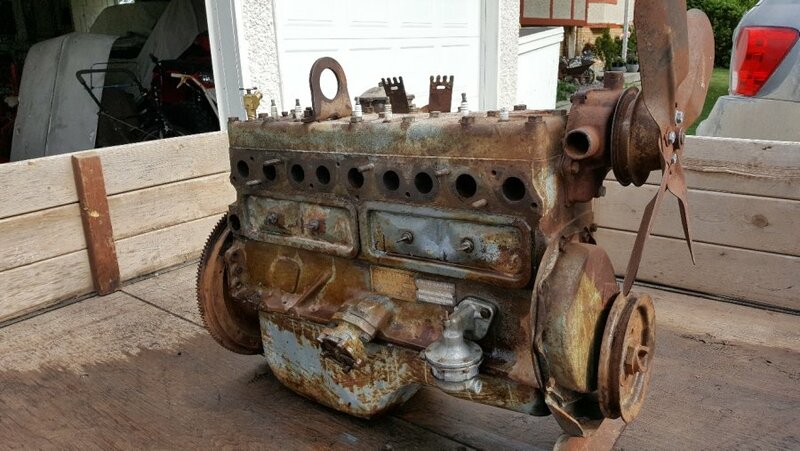 This would or could make a nice little revver of an engine. Okay so my "old faithful, 228 ci Fargo engine is getting tired after a 62 year dedicated and reliable service. Recently compression tests indicate some compression loss, dry tests and wet tests numbers about the same, cold tests lower than warm engine tests. 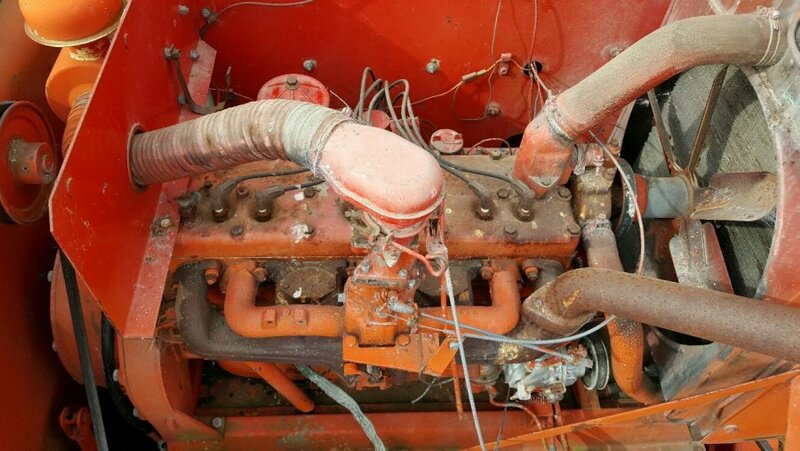 it was high time for a more reliable test which could more precisely isolate what is going on inside this engine. 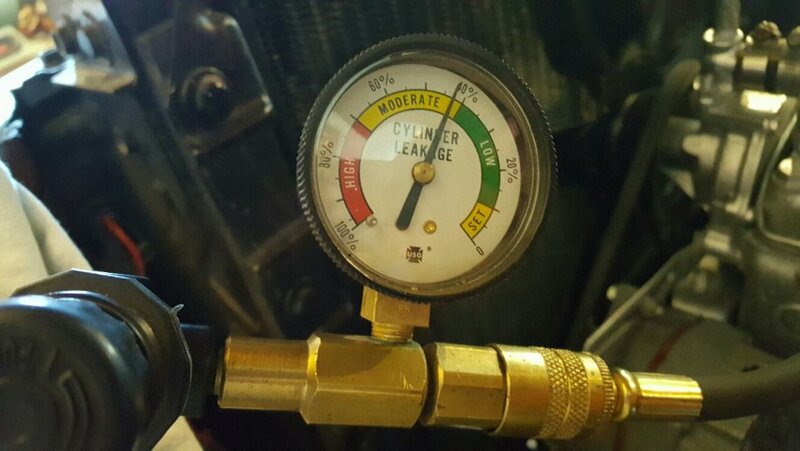 Compression tests are a good indicator often of a healthy engine, in my case, I was getting compression numbers of 90-95 psi, on all cyls except for cylinder 4, which was about 80 psi. 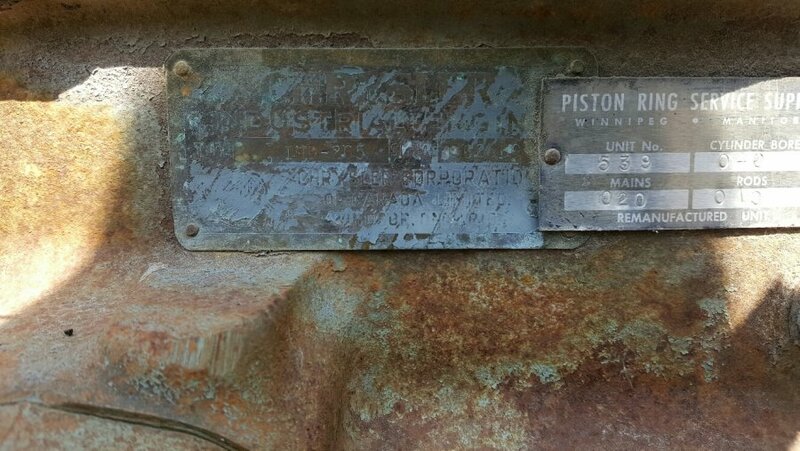 Adding il down the sparkplug hole did little if any to change the numbers. Thanx to a good Pal locally borrowed his Cylinder Leakdown Tester, this I used on both cold and warm engine. The results are as follows, on all cyls, escept cyl 4 moderate pressure loss, to the tune of 40%, and cyl 4 near 80 %. I could not hear any air rushing out of the intake/carbs or tail pip, but on cyl #4 I could hear some air out the tail pipe. On all cyls air leakage was coming out the oil filler pipe, telling me, my rings and cylinders are leaking moderately. Now compression rings are leaking, or upper cylinder wear or possibly even broken rings. This engine has really good oil pressure, and does not smoke or burn oil out the tail pipe. It does however have some blowby out the filler tube pipe, such as life, this engine has earned its right to smoke a bit after 62 years of service. So yesterday scored 2 265 engines, both turn both run, the 1 out of it,s application was run few years ago. 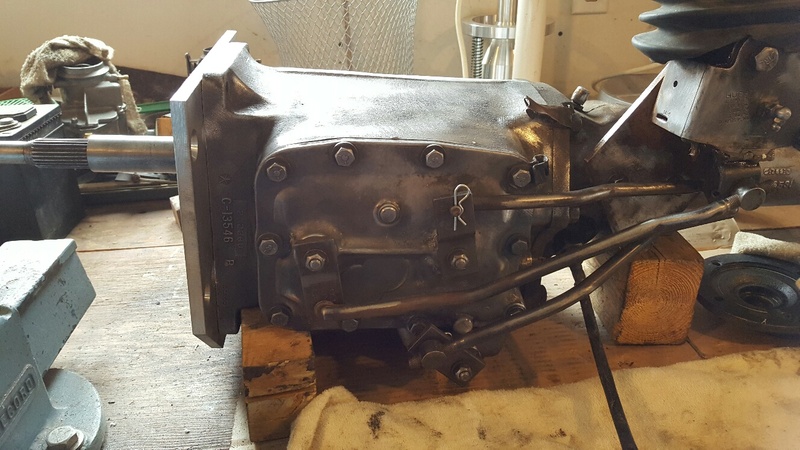 I can now add this to my other 265 engine, for 3 of these babies for future use for myself or other flathead Hi Perf enthusiasts. The gent I am acquiring these engines from also had a 237 and a 250 both running, he also had a low mile 313 Poly V8, so a real Mopar dude. 1 engine spins freely, has nice dark oil, quite clean valve lifter chambers, and no broken manifold studs in the block. I will of course need to go over this engine, it has been rebuilt once at Winnipegs largest engine rebuilder, then and now, Piston Ring Service, .040 pistons, .010 rods, 0.20 mains. Now if the mains are out of spec again, might not use this crank for Hi Perf use. Here are some pictures, it was a great afternoon and visit.. Okay, here is a blog update, and is of course a Mopar 4 Mopar solution. Yesterday while cutting grass on my lawn tractor, noticed something looked wet on the back side of the right rear tire and upon close inspection, it looks like a wheel cyl started leaking. I pulled the brake a apart, some leakage, but not super bad yet, shoes were saveable, so rolled up my sleeves and got to work. 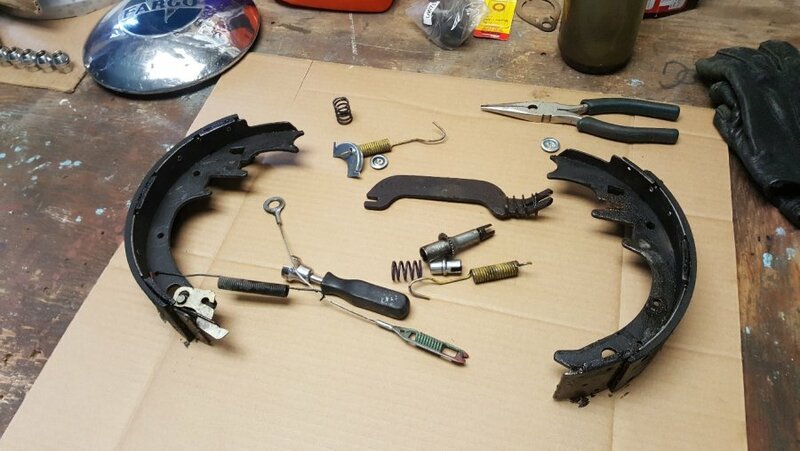 I cleaned all the parts, and shoes, as well as the drum, with brake clean, then painted drum to a nice gloss black. 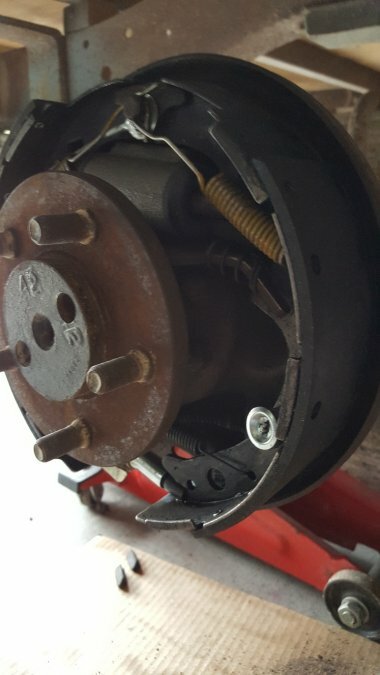 Once all was back together, it was time to bleed the brakes, nobody was around as it was getting on into the night, and the wife did not feel up to helping me out. I used my Lisle 1 man brake bleeder kit, and bled the brakes, and got out some nasty fluid, which surprised me as I had bled the brakes only a few years ago. brakes were not bad, but not quite as good as before, thought I might have air in the system, so decided to try gravity bleeding, so up front I first pulled the bleeders out of the stock type drum brakes, well they both had restrictive crud in them, So got them nice and clean, but gravity bleeding didn't work so well with a master cylinder, so low in the mix. 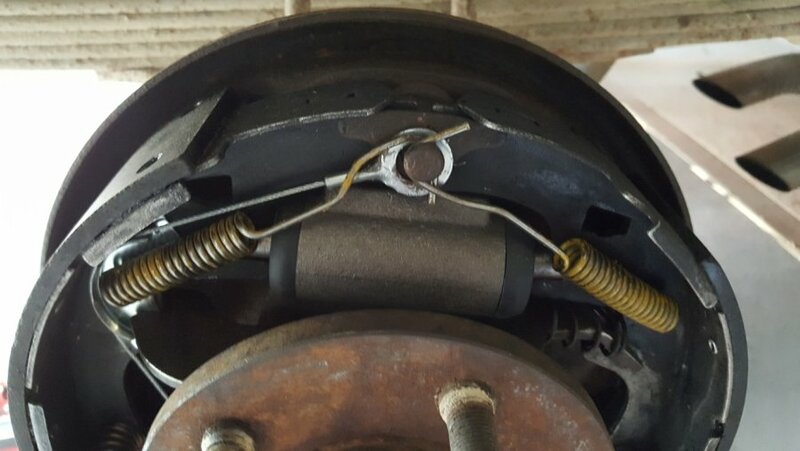 Back to the 1 man bleeder kit, and a pole to hold brake pedal down between bleeding, this worked well. it then dawned on me to check all the brake adjustments, and had to adjust the right rear drums, a lot, as they had just been apart, also the left rear needed some, and the fronts were fine as is. Okay today picked up one of the 265 engines. It looks good, lifter chamber clean as whistle, has compression, oil while dark was clean and not full of metal flakes or anything. Plugs don't look bad either. 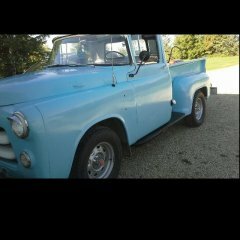 I asked a lot of questions, Gent I bought it from purchased it 25 years ago from an old Farmer, he either had his engine rebuilt or bought a rebuilt engine from Piston Ring Machine in Winnipeg. 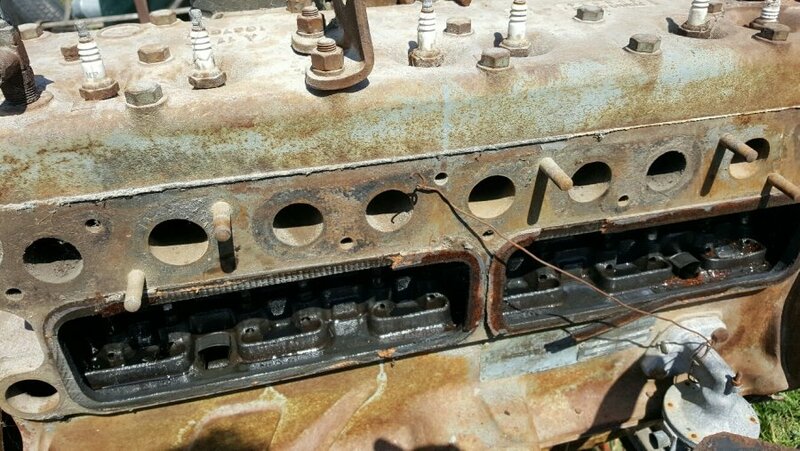 The big plan is to hopefully use this engine without a rebuild, but shave head and install a wilder cam.